Thanks to the deep lip made by the case because of the raised bezel, we can safely place it down on a surface without it coming into contact with the screen. Nevertheless, you’re still going to need some precaution, especially if the phone drops at a weird angle. In terms of design, it looks pretty generic at first with its tough rubbery material, which sports a glossy finish. Despite that, the longer we look at it, the more its design makes an impression on us. Indeed, the CandyShell Card Case adds some thickness to the iPhone 6, but it does it in a meaningful manner because the durable material it’s constructed from is certified to meet or exceed MIL-STD-810G for drops. 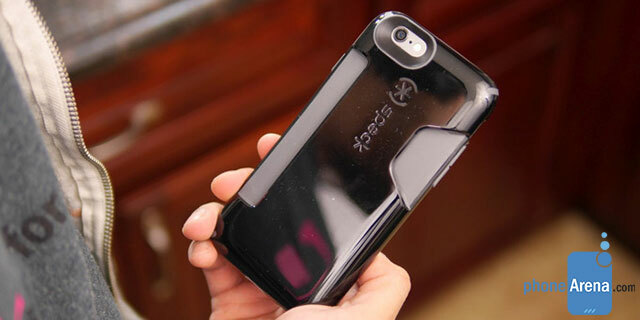 That’s all accomplished by the dual-layer design of the case, which absorbs shocks to ensure the phone is safely protected inside of it. Now, the convenience of it all is its ability to accommodate up to 3 cards or IDs in its compartment in the back of the phone. They all slide into place, naturally, offering a snug fit and whatnot when 3 are inserted, but it’s a bit loose when only one is placed in there. Out of all the wallet cases we’ve checked out for the iPhone 6/6 Plus, the Speck CandyShell Card Case is undoubtedly the most protective out of the bunch. At the same time, too, it’s sporting a price point of $39.95, which is available in 4 different colors. Click here to read the full review on their website.